I don’t know if you’ve heard but I took ownership of my new puppy, Brandy Snap, on Thursday. 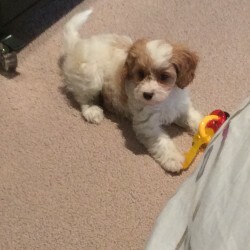 She’s a Cavoodle, a Cavalier King Charles Poodle Cross. She’s only 8.5 weeks old and she’s tiny. The problem is, I’m on deadline and I’m way behind. Life has got in the way the last 2 months with very sick relatives and close friends in hospital etc. I had to collect her from a breeder 2.5 hours drive away and Brandy was so good in the car. She cried a little bit and then went to sleep. She wasn’t car sick at all! In fact, when I had to put her back in the travel crate to go to puppy pre-school that same night, she didn’t whimper at all. She passed with flying colors at puppy pre-school, learning to sit very quickly. She’s settling in well. We’re having a few toilet issues but she is learning to go on the paper. She is not sleeping well, which is therefore keeping me awake too. She cries in her bed at night. She’s starting to explore the house bit by bit, but is still very nervous and of course she follows me everywhere, like she’s become my shadow. So, my writing buddy and critique partner, Gracie O’Neil has kindly come to ‘puppy sit’. Wish me and Brandy luck, and thank you, thank you, Gracie! PS. any tips on Puppy training would be appreciated. Congratulations on bringing Brandy home! We have a puppy in our household too, though at six months old she’s not a baby anymore. One tip our breeder shared with us: when she starts teething, wet and freeze an old dishcloth and give it to her to chew on. It might save some damage around the house. Thank you, that’s a fabulous idea.